Kim: Western Pennsylvania! What is your favorite sight, sound, and smell of the Keystone State? Holly: I live in Lancaster County, Pennsylvania, but was born and raised in Latrobe, in the western part of the state. While driving back on the turnpike recently it struck me, as it always does, how gorgeous Pennsylvania is with its magnificent views of patch-worked farms and forest lands, especially after exiting the Tuscarora or Blue Mountain Tunnels. It always makes me think about the Native Americans and the first settlers in our state and how some of the dense woods and topography that I am seeing now is the same that they saw centuries ago. It is no surprise they decided to carve out a home. Spring time is a favorite season of mine and much of that can be attributed to the smell of turned dirt. There is something very basic, very primitive about that loam scent that reminds me of all the simplest and most treasured things in life. Being in Lancaster County is a boon for me, as it is home to some of the richest and most productive soil on the planet, and there is no shortage of turned fields in the spring. The smell outside of the Wilbur Bud chocolate factory, or of spaghetti sauce when it is simmering on the stove, and the perfume my mother wore all of her life are all somewhere at the top of this list as well. Pennsylvania is not the only place in the world to hear laughter but it is the only place to hear the laughter of my daughters and grandchildren and husband and friends. I don’t mind the babble of a brook or the hiss of a campfire either. Holly: My husband, daughters, and my sister have always been very supportive of my writing and my attempts at traditional publishing. I wrote query letters, mailed them, and waited for replies from a publisher or an agent about my books for a decade or more and my family was there to celebrate the positive and commiserate about the negative. I attended conferences and worked diligently to try and make my writing better and learn every lesson I could from those with more experience, but I was never able to land a contract or an agent. I had given up writing for about two years when Amazon began to offer self-publishing. My husband encouraged me to try selling one of my books there and I published Romancing Olive in November of 2011 and began to sell books and gather readers. I followed in the spring of 2012 with Train Station Bride, not knowing that mail order brides were a ‘thing.’ That book took off and I’ve never looked back. In addition to my family, I’ve met some wonderful folks along the way, bloggers and reviewers that were kind enough to share my books with their followers. I’ve been very fortunate! Kim: Tell us about THE MAID'S QUARTERS - what inspired it? Holly: The main character in The Maid’s Quarters is Alice Porterman. She is a character in the second book of the Crawford Family series, Contract to Wed, as a maid to Jolene Shelby. Alice was an integral player in how Jolene’s story unfolded, however she was never the focus of a section of that book as some other minor characters were and I always felt she had a story to tell. Kim: What's next for Holly Bush? 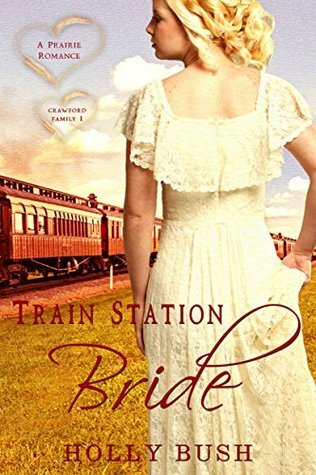 Holly: The Crawford Family Series began with Train Station Bride where we meet the middle daughter, Julia. She agrees to marry an aging shopkeeper who she has corresponded with in order to escape a life of ridicule and begin a life of her own in South Dakota. A mix-up at the train station changes her plans irrevocable. 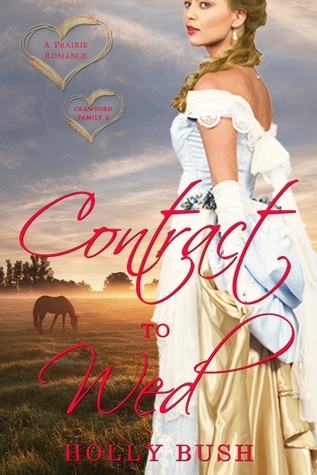 Contract to Wed is the second book and is about Jolene Crawford Crenshaw Shelby, the oldest daughter, who is sometimes bitter and cold, but has had some tragedies in her life that she has never dealt with. She agrees to marry the brother of an acquaintance in order to continue in the elevated social position she is accustomed to. Jolene takes only her maid, Alice, with her when she moves to Texas. I am currently writing Jennifer’s story, the youngest Crawford daughter and am hoping to publish that book this fall. It has been wonderful to be here! Thank you so much for having me! If anyone has questions, feel free to ask – I love to gab romance! Mahalo, Holly, for sharing your historical world with us! Learn more about Holly and her books at hollybushbooks.com. The Maid’s Quarters novella is part of the Crawford Family Series, featuring Jolene Shelby’s maid, Alice. 1. Leave a comment about Pennsylvania - what do you know about it? My in-laws hail from Latrobe, home of Rolling Rock, Mr. Rodgers, and Arnold Palmer. I've been to Pennsylvania a couple times. My step mother was raised in Lancaster and her kids attended Lancaster Mennonite High School (I think). They both stuck around so I went to my step brother's wedding in Lancaster many years ago. QVC is headquarters on in West Chester PA! Hello all and thanks for stopping by! Good luck! We used to drive through Pennsylvania on our way to visit family in Ohio. We were stationed at Andrews AFB. Pennsylvania has some beautiful countryside, and I always enjoyed the drive. I lived in Pennsylvania for a number of years. There are some very scenic areas in the state, but I don't miss the harsh winters. I'm only familiar with Pennsylvania because Penn State is part of the B10... I've never travelled to a game there. I've driving thu your state back in the late 60's to visit family then living in Trenton New Jersey.. My dad let me drive on the turnpike at night and that was kinda scary for a teenage driver!! When I was 14 I want to Pjiladelphia. I remember seeing the Liberty Bell. We drive through PA whenever we head north to visit relatives. The state has much to offer visitors and we haven't done nearly enough of it. There are many good historic sites to visit. Gettysburg is still on our list. The coast has been settled a long time - history, The Navy Academy, and Baltimore with its aquarium and harbor area is a must see. You have Hershey which is nice to visit or just drive through and smell the chocolate. Amish country is on the must visit list. The mountains are nice, but a bit stark along I-81. Almost anyone can find something to enjoy during a visit. I have not yet read your books, but like the sound of the blurbs. I hope they are all doing well. Hi Pat, I'm glad you like the sound of my books and hope you'll try one. They are doing well. I am very fortunate about that. There is plenty to do in PA. I live in Lancaster County and is the home for many Amish. The Lancaster County Visitor and Convention Bureau is a great place to find things to do if you visit here. Gettysburg is a wonderful historic site to visit. Happy travels!